We provide balloons to suit any occasion, please call into our shop to see the full range or just give us a call to discuss your full requirements. We can provide a large selection of Helium filled balloons that will bring a smile to any Birthday Boy or Girl. Helium filled balloons that will bring a smile to any new Mother and baby. 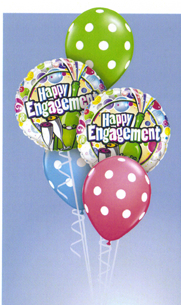 Helium filled balloons that will bring a smile to any newly engaged couple or bride to be on her Hen Night. Helium filled balloons that will bring a make any reception perfect for any newly married. We also do floor walkers table displays and wedding arches. 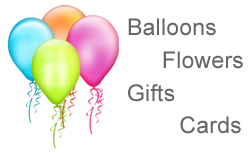 Large selections of Helium filled balloons that will make any anniversary special for any celebration. We also do floor walker’s table displays and stands. We provide a large selection of Helium filled balloons that will make any celebration or special event a little bit more special. From Birthday Dinners to Casino nights, kids parties you name it we can do it we also do floor walker’s table displays and stands. We stock candy treat trees and can create the perfect bouquet for any occasion to order. We also stock christening gowns, baby hats and socks. Get in touch for more details.